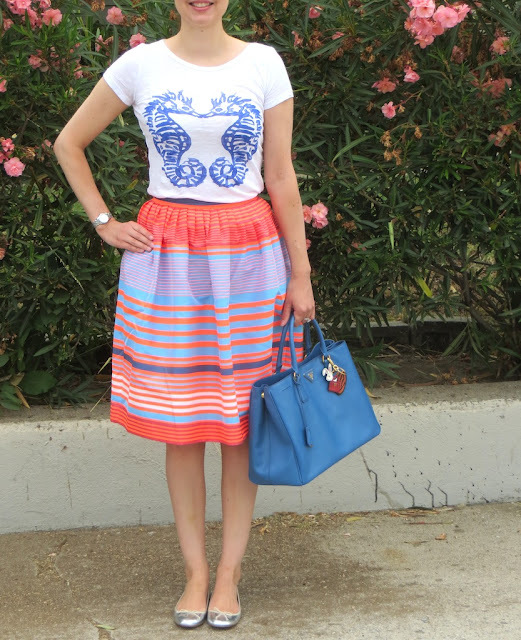 For summer, I'm becoming really fond of the whole graphic T-shirt paired with a skirt combo. It's a great way to make the T-shirt a little dressier and the skirt a little more casual. As I previously explained in my post about my Target seahorse dress, I think seahorses are the official mascot of summer this year (move over Mr. Lobster!). The blue hue of this "vintage" cotton seahorse tee from J. Crew is just the perfect match for many of my skirts. I reached into the depth of my closet and pulled out this neon striped skirt from the J. Crew collection. Although the skirt is silk, the cotton tee tones it down just a bit, or maybe not. My father-in-law acted like he was blinded by it when he saw me today and my husband said it was a daring display of bold color. (The color is more neon in person than appears in the pics.) Men and their lack of fashion sense! I was stopped by a few women who adored the skirt and wanted to know where it was from, so what do males know? 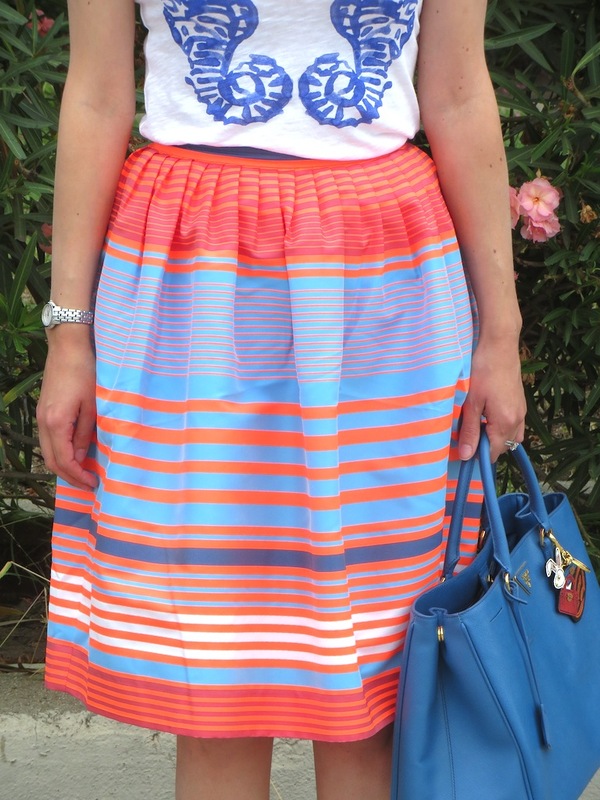 To be a little self-deprecating, I would personally describe the skirt as looking sort of like a billowy beach ball, but that just goes along with the whole nautical/underwater theme I have going on today. Hello Katie. 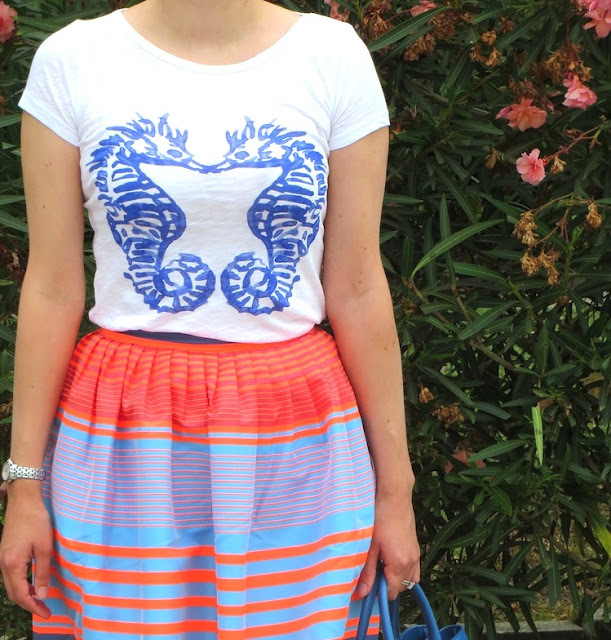 I really like this skirt with the seahorse tee. Thanks for a great idea on how to wear mine. Thanks for stopping by Celle! I guess we are shirt twins! I think this shirt looks great paired with stripes and is pretty versatile. Have fun wearing yours! Hi Katie! I love this combination of the seahorse tee and skirt - beautiful colors. Thank you! I thought it would be a fun combination too and you can't go wrong with blues and oranges together. i think this combo is perfect katie!